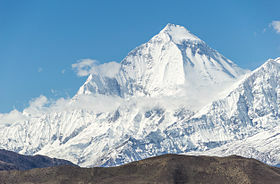 The Dhaulagiri massif in Nepal extends 120 km (70 mi) frae the Kaligandaki River wast tae the Bheri. ↑ "Dhaulāgiri, Nepal". Peakbagger.com. Retrieved 2011-04-26.